One Appliance – One Image is what Cisco is targeting for its Next Generation Firewalls. With this vision, Cisco has created a unified software image named “Cisco Firepower Threat Defense”. In this FirePOWER series article we’ll cover the installation of Firepower Threat Defense (FTD) on a Cisco ASA 5500-X series security appliance. We’ll also explain the management options available: Firepower Management Center (FMC) which is the old FireSIGHT and Firepower Device Manager (FDM). Cisco Firepower Threat Defense (FTD) is a unified software image, which is a combination of Cisco ASA and Cisco FirePOWER services features that can be deployed on Cisco Firepower 4100 and the Firepower 9300 Series appliances as well as on the ASA 5506-X,ASA 5506H-X, ASA 5506W-X, ASA 5508-X, ASA 5512-X, ASA 5515-X, ASA 5516-X, ASA 5525-X, ASA 5545-X, and ASA 5555-X. However, at the time of writing, the Cisco Firepower Threat Defense (FTD) unified software cannot be deployed on Cisco ASA 5505 and 5585-X Series appliances. Simplifying management and operation of Cisco’s Next Generation Firewalls is one of the primary reasons Cisco is moving to a unified image across its firewall appliances. 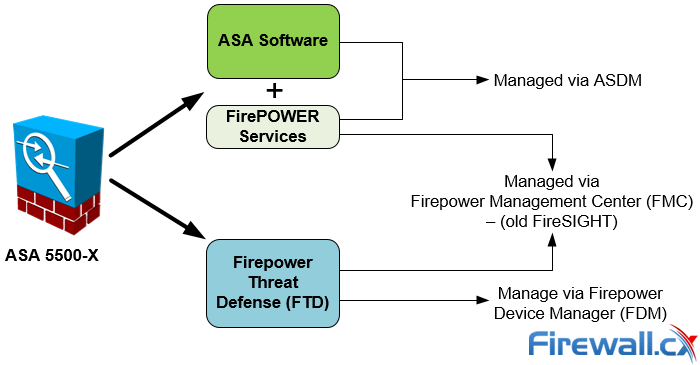 Currently the Firepower Threat Defense can be managed through the Firepower Device Management (similar to Cisco’s ASDM) and Firepower Management Center (analyzed below). It should be noted that the Firepower Device Management software is under extensive development and is not currently capable of supporting all configuration options. For this reason it’s best to rely on the Firepower Management Center to manage the Cisco Firepower Threat Defense system. The Firepower Management Center, also known as FMC or FireSIGHT, is available as a dedicated server or virtual image appliance (Linux based VM server) that connects to the FirePOWER or Firepower Threat Defense and allows you to fully manage either system. Organizations with multiple Firepower Threat Defense systems or FirePOWER Services would register and manage them from the FMC. Alternatively, users can manage the Firepower Threat Defense (FTD) device using the Firepower Device Manager (FDM) – the concept is similar to ASDM. Currently the latestCisco Firepower Threat Defense (FTD) unified software image available is version 6.2.x . While the Cisco Firepower Threat Defense is being actively developed and populated with some great features, we feel that it’s too early to place it in a production environment. There are some stability issues, at least with the FTD image on the ASA platform, which should be ironed out with the newer software releases. If you are already in the process of installing FTD on your ASA then you should heavily test it before rolling it out to production. Due to the issues encountered, we were forced to remove the FTD installation by reimaging our ASA 5555-X Appliance with Cisco ASA and FirePOWER Services images. We believe the “Cisco Firepower Threat Defense” unified software image is very promising but requires some more time to reach a more mature and stable version. While small deployments might be able to overcome the absence of many desired features (e.g IPSec VPN support), enterprise environments will certainly find it more challenging. Depending on the environment and installation requirements customers will stumble into different limitations or issues. For example, on our ASA 5555-X we had major delays trying to push new policies from the Firepower Management Centre (FMC) to the newly imaged FTD ASA. With a total of just 5 policies implemented it took over 2 minutes to deploy them from the FMC to the FTD. We also found that we were unable to configure any EtherChannel interfaces. This is considered a major drawback especially for organizations with multiple DMZ zones and high-bandwidth traffic requirements. Cisco has an official announcement for this right here. In addition to the above, when we completed the conversion of our ASA to the FTD software we needed to open a TAC Service Request in order to get transfer our ASA License to the FTD image, adding additional unnecessary overhead and confusion. We believe this should have been automatically done during the installation process. How to Get a Free Fully Functional Cloud-Based Unified Communications PBX with Free Trial Hosting on Google Cloud, Amazon or OVH! Crazy as it might sound there is one Unified Communications provider who is giving out free fully functional cloud-based PBX systems without obligation from its users/customers. 3CX, a leader in Unified Communications, has just announced the availability of its new PBX Express online wizard designed to easily deploy a PBX in your own cloud account. 3CX’s Advanced Unified Communications features were recently covered in our article The Ultimate Guide to IP PBX and VoIP Systems - The Best Free IP PBXs For Businesses. In the article we examined the common components of a modern Unified Communications platform and how they are all configured to work together enabling free real-time communications and presence for its users no matter where they are in the world. Now Free Cloud-based services are added to the list and the features are second to none plus they provide completely Free Trial Hosting, Domain Name, associated SSL certificates and much more! 3CX’s intuitive dashboard allows quick & easy administration with zero prior experience! 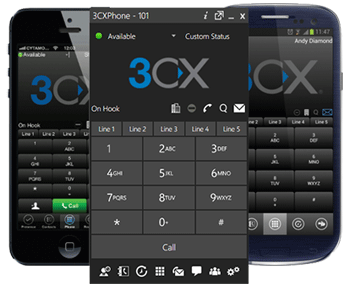 Grab your copy of 3CX’s Free Cloud-Based UC PBX System Now! Zero Maintenance – Everything is taken care of for you! Free Trial Hosting on Google Cloud – Amazon Web Services or OVH! 3CX’s Unified Communications PBX system is an advanced, flexible PBX that can be run locally in your office at no cost which is why thousands of companies are switching to 3CX. 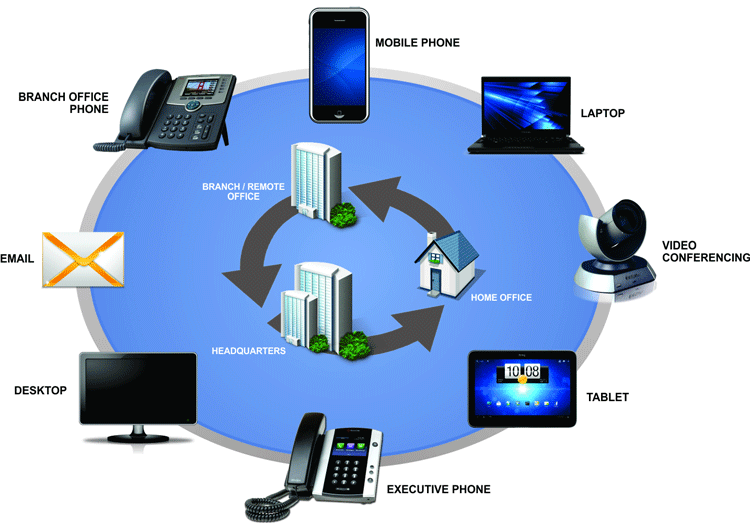 With the choice of an on-premises solution that supports Windows and Linux operating systems and now the free cloud-based hosting – it has become a one-way solution for companies seeking to move to an advanced Unified Communications system but at the same time seeking to dramatically cut telecommunication costs. 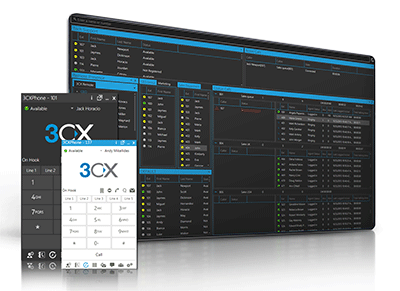 Download Free 3CX On-Premises or get your Free Cloud-Based UC PBX System Now! Thanks to its support for any SIP-based IP phone and mobile device (iPhone, Android, iPad, Tablet etc.) the 3CX IP PBX has quickly become the No.1 preferred solution. 3CX’s commitment to its customers and product is outstanding with regular updates covering its main UC PBX product but also mobile device clients - ensuring customers are not left with long outstanding problems or bugs. 3CX recently announced a number of bug fixes and enhancements for the 3CX Client for Android but also the 3CX Client for Mac confirming once again that it’s determined not to leave customers in the dark and continually improve its services and product’s quality. Read The Ultimate Guide to IP PBX and VoIP Systems - The Best Free IP PBXs For Businesses article for more information on the 3CX UC solution. The market for Virtual Private Networks has exploded over the past few years. A wealth of new providers has appeared, promising logless browsing, true anonymity, and fast speeds. Through all that noise, it’s becoming increasingly difficult to find the Best VPN for your needs. Thankfully, there are some established brands that stand above the rest. 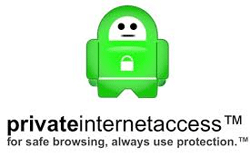 One of these is Private Internet Access (PIA), launched by London Trust Media in 2010. PIA is very popular for P2P downloads, allowing torrents on every server via secondary VPNs. In addition, PIA keeps no logs and eliminates DNS leaks, IPv6 leaks, web tracking and malware. It boasts over 3200 servers across 24 countries, as well as a free SOCKS5 proxy. It’s a fast VPN and quite wide-reaching. All of this comes at a price of only $3.33 (US) a month, though there are a few caveats. Primarily, there is a slightly limited ability to bypass region blocks. PIA might require logging into a few VPN servers to find one that successfully unblocks Netflix or Hulu, but does work without a problem with BBC and other geo-restricted content. Additionally, its popularity means users are more likely to be incorrectly blacklisted from sites. While the desktop VPN client seems fairly simple, the iOS and Android clients are have a more pleasing look and interface. Despite the simplified desktop interface PIA still remains one of the Best VPNs around offering great value for money. Although it may not be the most beautiful VPN client out there, the sign-up and install process for PIA is simple, and the website is nice enough to make the signup and client installation an easy-to-follow process even for novice users. Registration requires only a couple of clicks and an email address. PIA takes care of the password for you, sending your user and login details via those details. You’re also given a link to the client installer for each platform, guides, and a dedicated new user support thread. It’s all fairly fool-proof. 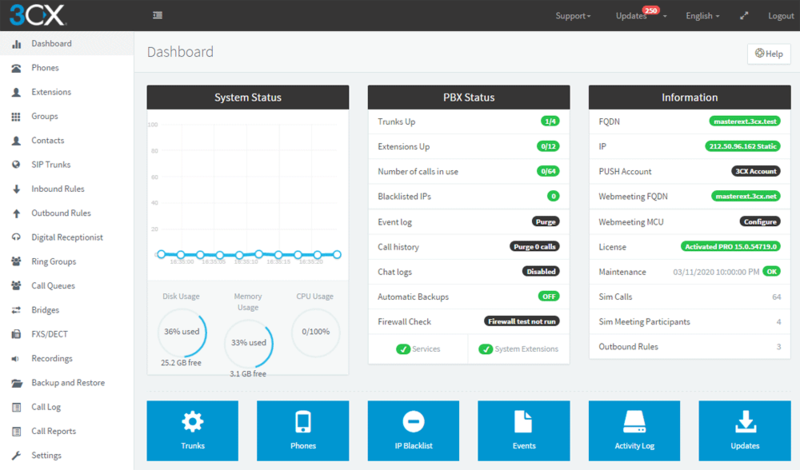 3CX, developer of the software-based unified communications solution, has announced the release of 3CX V15 Service Pack 5 which brings the final Linux version of the PBX. The update achieves complete feature parity with the popular Windows version of the software. The company also reports that SP5 has added further automation of admin management tasks and made hosting of the system in the cloud easier with leading cloud providers. If you’re looking for a free Unified Communications solution compatible with mobile phones and any SIP IP phone while at the same time provides advanced collaboration features then look no further. Download and run the free 3CX UC system now. Available for both Windows and Linux operating systems. Automatic uploading of backups to a Google Drive Account. Automatic restoration of backups to another instance with failover. Automatic installation of OS security updates for Debian. Automatic installation of 3CX tested product updates. Automatic downloads of tested phone firmwares and alerts for outdated firmware. A Labs feature to test upcoming updates released for BETA. GMail or Office 365 accounts can be more easily configured for notification emails from the PBX. Automatic push of chat messages to the iOS and Android smartphone clients. Download V15 for Windows here. Guide for Linux installation. Debian Linux 8 ONLY. Guide for Deploying and Provisioning 3CX Automatically. Back then, the Internet was so very young. Those were the times of Windows Maze Screensaver, of the classy Minesweeper, of grey-white MS Paint, and of silvery floppy disks. Gone are those days. Now, after completing its silver jubilee, the Internet has grown to be almost a multiverse of information, every micro-second its network mushrooms like anything. But even maturity comes with its own struggle. This enhanced version of the Internet carries its own privacy concerns. But not to worry, there are plenty of technologies and software developed to preserve your Internet privacy. TOR and VPN are the popular ones. So, here we explore and share which of the two comes out to be a better way to achieve a superior level of privacy on the Internet. What if, at all times, someone is keeping an undersea eye on what you browse over Google, always peering into the messages as you chat with other people? Wouldn’t that make you uneasy? This is Internet privacy. That is, whatever information you share, or browsing you do over the Internet, keeps itself only to you, until you want it public. We continually hear about governments and ISPs spying on users and even other countries, which shows how unsafe the internet is. Thankfully, user awareness on internet privacy is continually improving as more and more users seek out bullet-proof methods to encrypt their communications and protect their online privacy. TOR or The Onion Router is a free, open source software that comes under the development and maintenance of The Tor Project, a non-profit organisation funded by the US Government. TOR enables users to preserve their anonymity over Internet communications. To download, simply go to www.TORproject.org. There’s two bundles available for downloading, one is Vidalia, which requires a web browser pre-installed on your system. However, the other one, the TOR Browser Bundle, is preferred as it puts TOR directly into your system without you having to fulfil any prerequisites or additional installations. TOR employs Onion Routing, a technology developed in the late nineties by a scientist named Syverson. 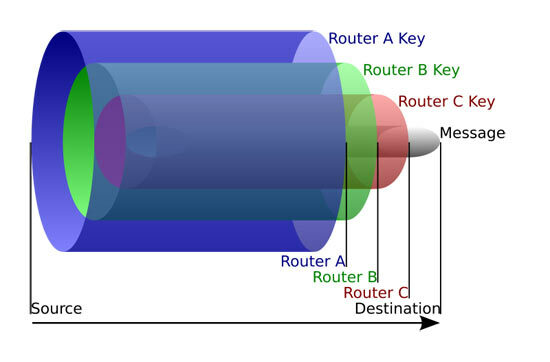 It works at the TCP Layer of the network, using a multiple hop pathway. Whenever a user sends data across the network, TOR creates a relay of nodes (or hops) that decrypts the data, one layer at a time. This is where the TOR vs VPN battle actually takes off. 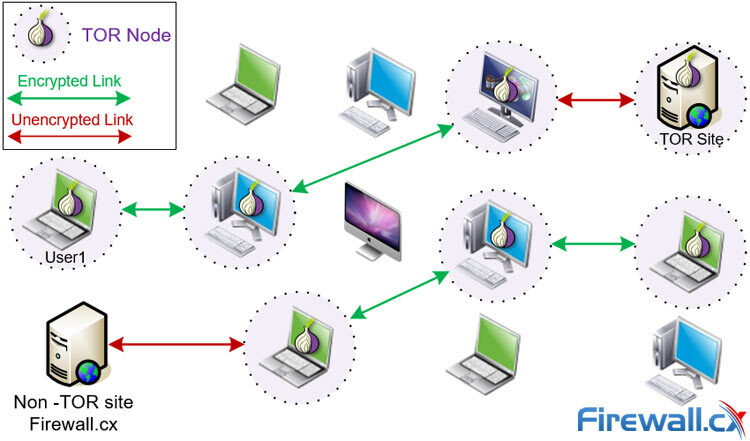 The relay of nodes is randomly selected proxy servers from the TOR users’ network. When the data travels from a user to the first node, it decrypts the IP address of the second node. Similarly, when it reaches the second node, it decrypts the IP address of the third node and so on till it reaches the last node. At each node only information about the next node is decrypted, thus maintaining the anonymity of the user over the entire network. When the data packet reaches the exit node, the node there finally decrypts the IP address of the destination server/node. Note that TOR nodes/users are also able to access normal (non-TOR) websites and hosts in a similar manner. An example to further clarify the concept: let’s say you want to send a picture to your friend over the internet, without disclosing your location/IP address.